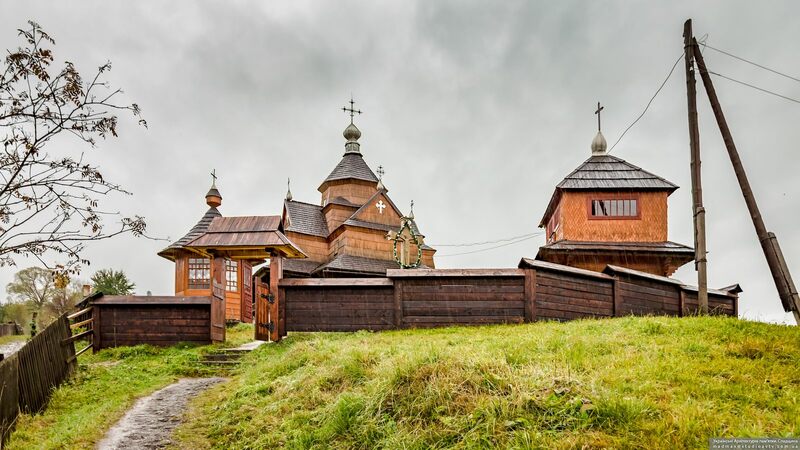 Vorokhta is an urban-type settlement and resort with a population of about 4,200 people located at an altitude of 850 meters above sea level in the Ivano-Frankivsk region, about 89 km south of Ivano-Frankivsk. Almost from all sides Vorokhta is surrounded by mountains and forests. This is a training center for Ukrainian athletes in ski jumping, biathlon, ski racing. 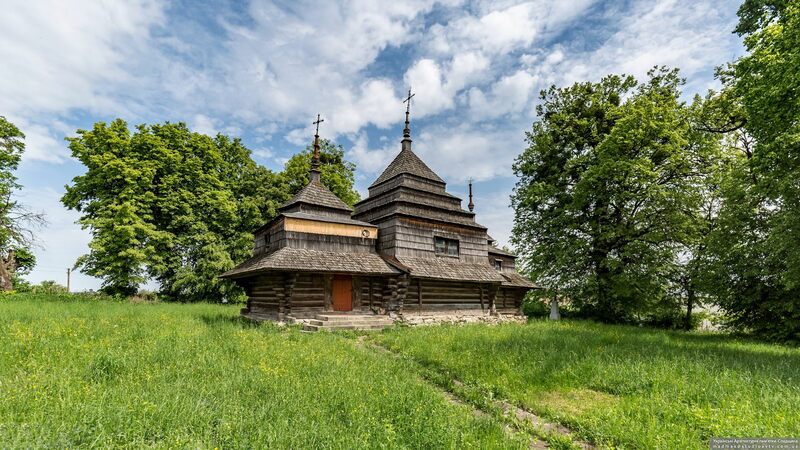 The main architectural landmark of Vorokhta is the wooden church of the Nativity of the Blessed Virgin – one of the best examples of Hutsul folk architecture built according to traditional technologies without a single nail in neighboring Yablunytsya in 1654-1657. Vorokhta on Google Maps. Photos by: Maxim Ritus. 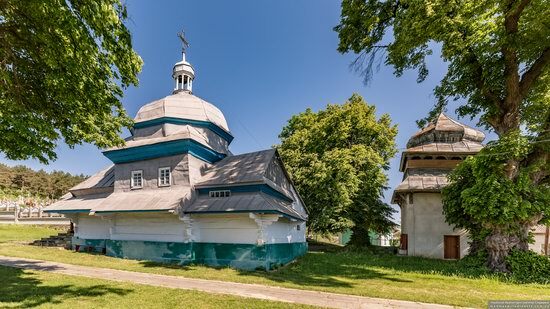 Another attraction of Cherche, a small village located in the Ivano-Frankivsk region, about 65 km north of Ivano-Frankivsk, in addition to the “old” Church of St. Basil the Great is the “new” Church of St. Basil the Great built of spruce in a new place closer to the center of the village in 1897. 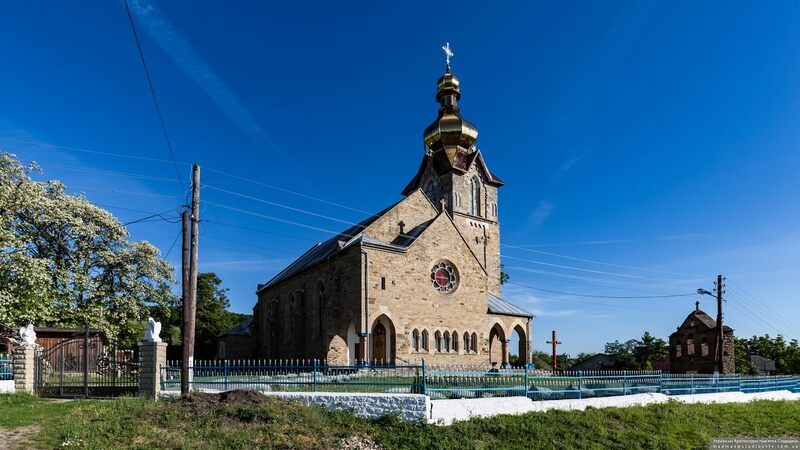 Today, the church belongs to the local community of the Ukrainian Greek Catholic Church. Next to this wooden church there is also a new stone church. Cherche on Google Maps. Photos by: Maxim Ritus. 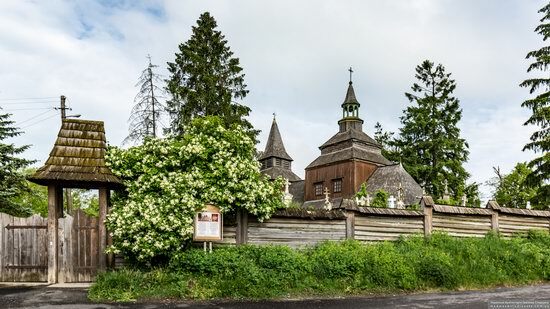 Pidhaichyky is a village with a population of about 900 people located in the Terebovlia district of the Ternopil region, 40 km northwest of Ternopil. In 1810, a Roman Catholic neo-Gothic church of hewn stone was built almost in the center of the village. In 1910, the church was transferred to the local Orthodox community and became the Church of the Exaltation of the Holy Cross. In 1947, the church was closed. In 1988, it was reopened and consecrated by the name of the Assumption of the Blessed Virgin Mary. Pidhaichyky on Google Maps. Photos by: Maxim Ritus. 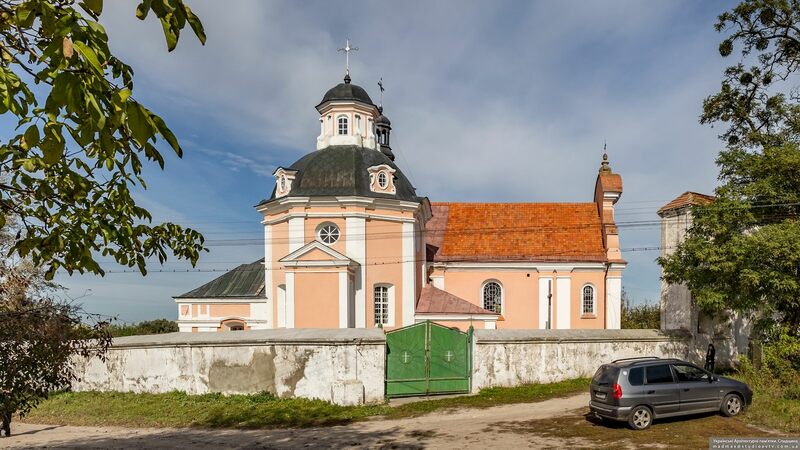 Cherche is a village with a population of about 1,100 people located in the Ivano-Frankivsk region, about 65 km north of Ivano-Frankivsk. The main attraction of the village is the wooden Church of St. Basil the Great, an architectural monument of national importance. This church, one of the most beautiful churches in the Ivano-Frankivsk region, was founded at least in the 16th century. It was moved several times from one place to another. At the current location, near the cemetery, the building was placed in 1733. Cherche on Google Maps. Photos by: Maxim Ritus. Derenivka is a village with a population of about 500 people located in the center of the Ternopil region, about 44 km south of Ternopil. One of the few architectural attractions of Derenivka is the wooden church of the Resurrection of Christ located in the central part of the village. The church was built in 1672. In 1715, it was reconstructed and got its current look. The high bell tower with four bells stands near the church. Derenivka on Google Maps. Photos by: Maxim Ritus. Rohatyn is a small town with a population of about 8,000 people located in the Ivano-Frankivsk region, about 60 km north of Ivano-Frankivsk. This town is considered one of the historic places of Ukraine. There are several interesting monuments of architecture in Rohatyn. 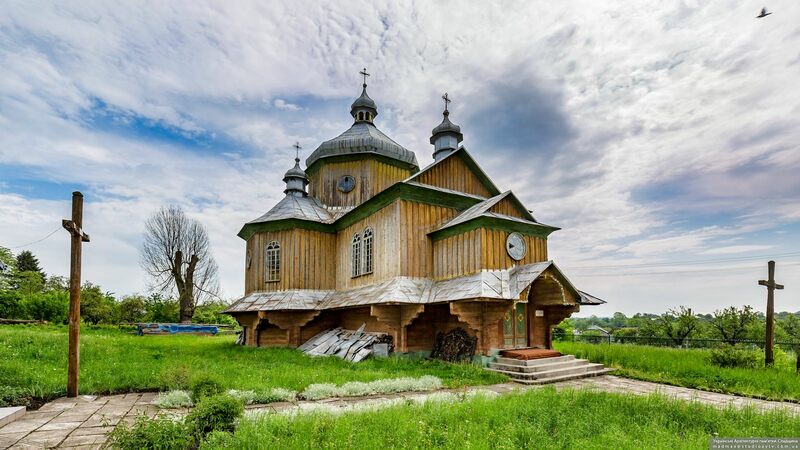 One of them is the wooden Church of the Holy Spirit – a monument of folk architecture and monumental art of national importance included in the UNESCO World Heritage List. Rohatyn on Google Maps. Photos by: Maxim Ritus. 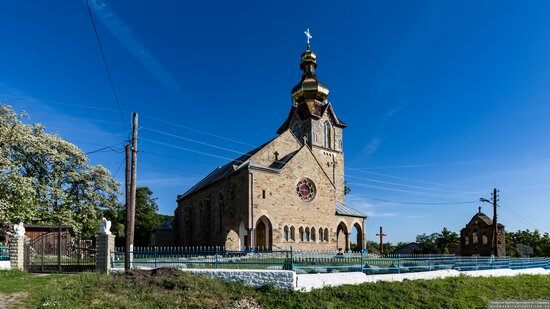 Founded in 1260, Chetfalva is a village of about 700 people located in the Berehove district of the Zakarpattia region, less than 1 km from the border with Hungary, about 90 km south-east of Uzhhorod. Chetfalva is a rather unusual place, street names are in two languages: Ukrainian and Hungarian. It looks like a typical Hungarian village. Local architecture is also very distinctive. In the foreground, you see a futuristic building with a strange parabolic arch-belfry – the ensemble of the Catholic Church of the Holy Spirit built in 1998-2001. Chetfalva on Google Maps. Photos by: Maxim Ritus. Brody is a city with a population of about 23 thousand people located in the north-east of the Lviv region. In the past, it was one of the largest trade centers of the Austro-Hungarian Empire. There are a lot of preserved architectural monuments here. The Palace of the Counts Tyszkiewicz, built in the style of English neoclassicism in 1909-1912, is one of these monuments. The palace is surrounded by a park with a pond. In Soviet times, the building began to be used as the Brody Leshoz, a forestry organization engaged in accounting, reproduction, protection of forests. 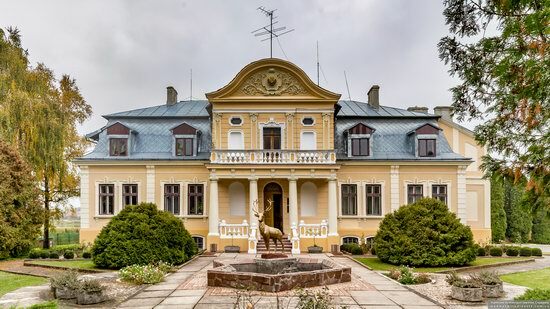 Tyszkiewicz Palace in Brody on Google Maps. Photos by: Maxim Ritus. 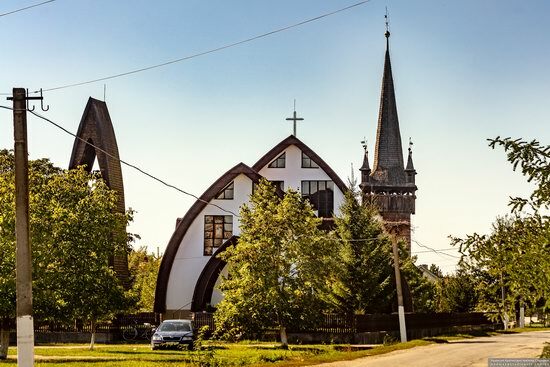 Korets is a small town with a population of about 7,200 people located in the southeast of the Rivne region, about 68 km east of Rivne. It is included in the list of historical towns of Ukraine. There are about a dozen architectural monuments in Korets. One of them is the Roman Catholic Church of St. Anthony – the oldest church in the town built in Baroque style in 1706. Korets on Google Maps. Photos by: Maxim Ritus. 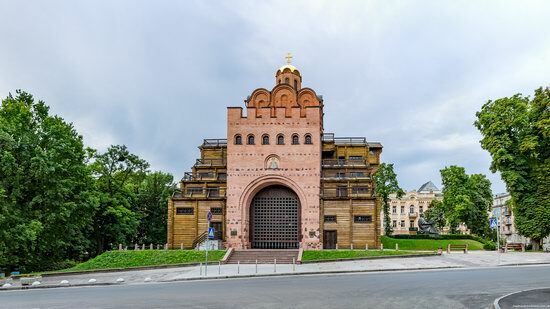 “The Golden Gate” (1018-1024), the main gate of old Kyiv, is a monument of defense architecture and one of the oldest buildings of Eastern Europe, one of the symbols of the capital of Ukraine. The gate was named by analogy with the Golden Gate in Constantinople. This building remained the gateway to Kyiv until the 18th century, although over time it fell into disrepair. In 1832, the first measures were taken to preserve the Golden Gate. In 1982, to celebrate the 1500th anniversary of Kyiv, the Golden Gate was completely reconstructed. In 2007, the latest reconstruction was completed. The Golden Gate of Kyiv on Google Maps. Photos by: Maxim Ritus.